Sometimes as a Orange County photographer I find myself documenting events for large corporations like AES. 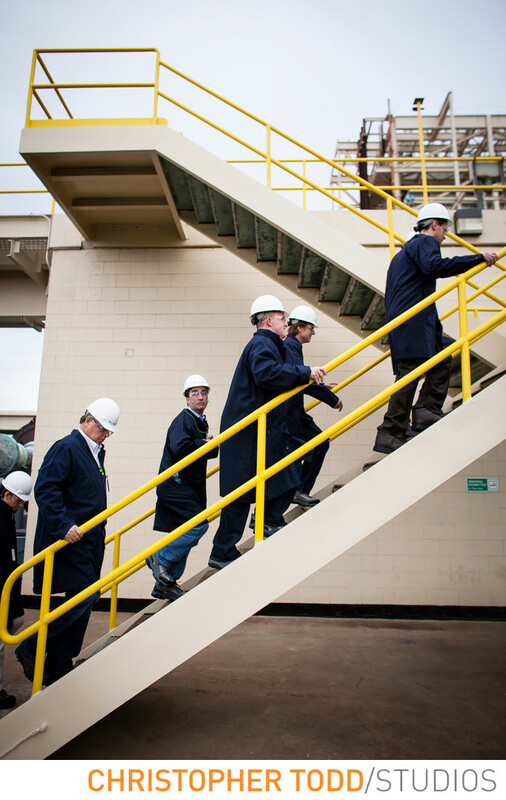 In this photograph I was assigned to follow a group of international executives and document their tour of a local power plant in Huntington Beach, California. This image was taken immediately after the executives put on their coveralls and hardhats and awkwardly started their climb up to the top deck of the AES power plant. It was awesome to get a up close perspective of the iconic HB powerplant after growing up in the area and spending time in my youth at the near bye beaches. Also because it is planned to be demolished and rebuilt in the next few years. I like the composition of the photo which displays strong directional lines of the stairs, creating 3 large triangles in the image, which would make many of my teachers in photography school very happy to see. Despite the dreary weather that day, I also appreciate the complimentary colors of the yellow handrail against the dark blue coveralls. I was excited to find out this image was used in a global energy enterprises annual report. If you need to create photographs for an upcoming Annual report my services might be a good fit for your project, as I am a professional documentary photographer with good interpersonal skills and an eye for composition, please call my studio at 800-501-2063 or visit my contact page to connect. Location: 21730 Newland St, Huntington Beach, CA 92646. 1/800; f/2.8; ISO 200; 24.0 mm.